Accueil Produits Bande originale La bande originale de “Million dollar arm”. La bande originale de “Million dollar arm”. Sortie : 13 mai 2014. 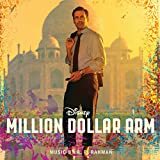 Film : Million dollar arm. 2. Million Dollar Dream (par Iggy Azalea) – 2:44. 3. Unborn Children (par Vairamuthu et Unni Krishnan) – 4:37. 4. We Could Be Kings – 3:08. 5. Taa Taa Tai – 3:25. 6. Keep The Hustle (par Wale) – 3:09. 7. Nimma Nimma – 2:29. 9. Never Give Up – 2:21. 12. Desi Thoughts – 2:51. 13. First Tryout – 2:30. 14. Calling Scouts Again – 1:38. 15. Welcome to India – 2:13. 16. The Final Pitch – 5:03.